And Utah. And Montana. And anywhere else fires are burning. It's hard to believe that the town which welcomed me so warmly last May is now burning. It breaks my heart. That little tiny white blob at the bottom is actually the massive Falcon Stadium, the Air Force Academy's football stadium, which seats 47,000 people. I thought this photo put the scale of the fire into horrifying perspective. 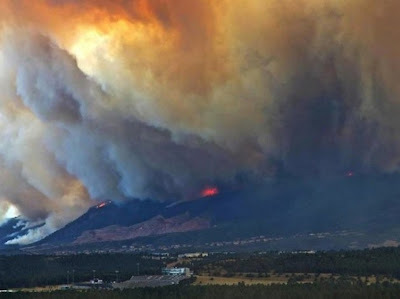 Pray that the brave men and women fighting these fires stay safe, and that they can get the conflagrations under control quickly. Pray also for the people displaced or burned out. For many, they will have to start their lives over. A gasp flew out of my mouth when I saw the first picture. And another when I saw the second. Praying hard now. I live outside of Price, Utah. We've had over 60,000 acres of fires within 50 miles of us. Yesterday we had one 6 miles away from my home. We figured if we were evacuated we would go to our cabin about 40 miles away. It is our bug out location. We know every back trail to get there. We even have horses that are trained to pack us in. We have supplies there and could hunker down for quite a wile. They evacuated that entire area yesterday while we were getting threats of evacuation here. Our back ways in were on fire. That would have left either heading for the evacuation center at the nearby LDS stake center or the desert to the south. We were prepping to bug out to the desert because it wouldn't have just been us it would have been our animals too. There's not much to burn in the area we were heading. I felt good about getting everyone out there until Hubby told me that if we were told to evacuate he would be called in to the hospital where he works to evacuate patients. We would have been down one driver. Now it became which animals get to go and which one get set free and hope for the best. Luckily we haven't had to evacuate because the final decision came down to my son driving the big trailer with the small livestock while I packed the horses to our rendezvous point over the scorching desert 6 hours (for me) away while hoping the fire wasn't too close behind. We were very aware of how close the fire was and how much time we had to get out. If the fire moved too quickly we would have left the animals and ran for our lives. With this plan there would have been no room for supplies just our bug out bags, animals and a few bales of hay. I wonder how many of those fires have been caused by Federal laws about land use/clearing brush/grazing. Funny you should say that, SwampWoman. We had a forest fire here. A small one. Only burned just over 20,000 acres. A 'controlled burn' on a windy day got out of hand. If you look closely to the shot with the AF Academy football stadium, right above it looks to be bare ground.... Well, it is a quarry.... Turns out that the folks that complained mightily about the "view" were actually saved in that the fire was turned from moving into their "neighborhoods". Tough choice, trees or bare ground. This time, the bare ground saved them..... I have also heard some "complaints" about the retardant dropped by aircraft. Look folks, if you live in the fuel of the forest fire there will be consequences. 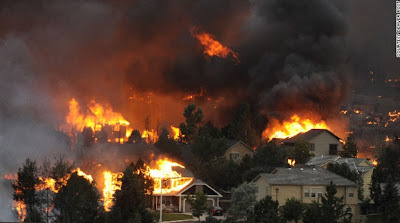 To the fire, homes & other buildings are just another fuel source. I Often wonder why people seek such places to live.... ocean fronts with hurricanes, along earthquake faults, at the bottom of avalanche chutes, within eye sight of a volcano, etc. No place is entirely safe of course. It does make one wonder though. Retired US Forest Service Firefighter.